Transposable elements play a significant role in determining the size, structure and expression of eukaryotic genomes. For example, four million transposable elements constitute 45% of the human genome. Given their uniformity in sequence and their critical role in metabolism, it is surprising that even the tandemly repeated rRNA genes have become the niche for a number of transposable elements. We study the R2 elements of insects. 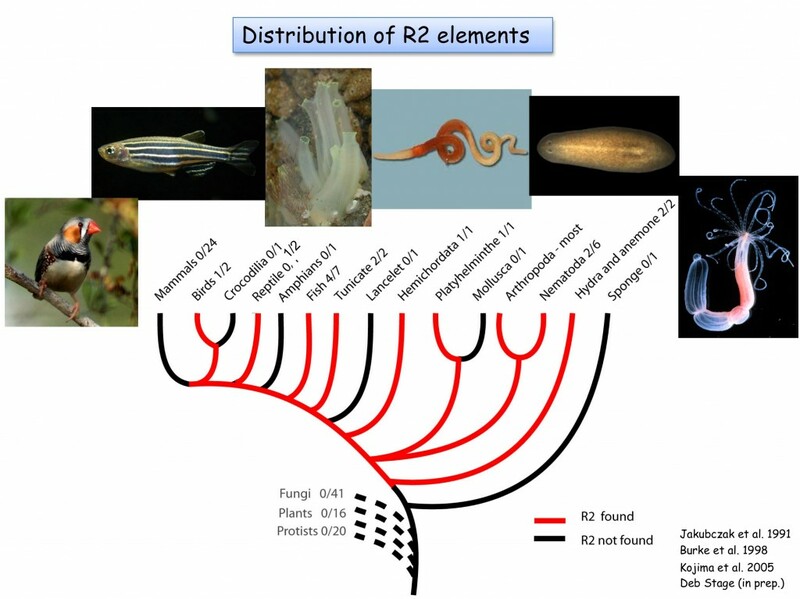 R2 elements have been found in many animal groups. Our studies are currently focused in four areas. 1. Biochemical studies of the mechanism of R2 insertion. 2. Regulation of expression of R2. Strains of Drosophila have been identified with active and inactive elements.Control maps within the rDNA locus itself. Crosses between active and inactive lines suggest that nuclear dominance plays an important role in controlling element activity. See regulation of activity. 3. Ribozyme processing of the R2 transcript. We have monitored the number of R2 elements, the number of rRNA genes and the level of R2 transcripts in different populations of Drosophila simulans. We found that the level of R2 expression does not correlate with number of R2 elements but rather with their distribution in the locus. Computer simulations suggest that using a model of R2 regulation based on their distribution in the locus can give rise to populations having stable numbers of R2 elements.